BlogPulse’s Trend Search is a nice feature I haven’t seen before, where you can track different search terms in the blogosphere. 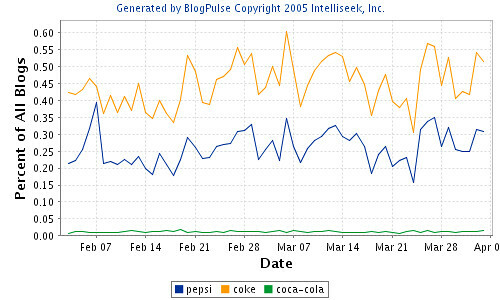 Take a look at this graph covering the blog posts mentioning Coke and Pepsi the last two months. It shows that Coke is discussed more frequently than its rival. The two graphs are following each other very closely, which makes me suspect that the difference between the two is due to the fact that Coke is not only carbonated water but also a drug. Here’s another example. 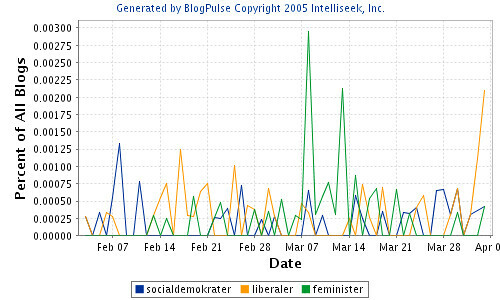 The Swedish blogosphere seems to be discussing feminists (“feminister”) more often than social democrats (“socialdemokrater”) and liberals (“liberaler”), at least during International Women’s Day. Also see BlogPulse’s new Conversation Tracker.